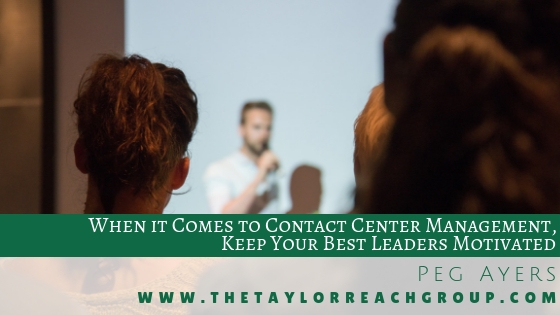 When it Comes to Contact Center Management, Keep Your Best Leaders Motivated | The Taylor Reach Group Inc.
Are all the leaders on your team equally skilled? Who do you think of first when you have something critical that must be handled brilliantly and immediately? We all have our preferences as to who we trust when the pressure is on. This makes it even more important to keep those leaders on your team. Losing one great leader like that might be the equivalent of losing two or more of your average leaders. What can you do to hang on to these high performing leaders? Gives new leaders confidence when they’re promoted, because they’ve been preparing for the role. 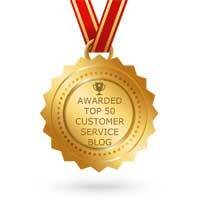 You’ll seldom hear someone say they’re thanked too often in the workday. Climbing higher on the career ladder leads to more criticism and less praise. It often seems nobody notices when you get it right, but nobody misses it if you get it wrong. The stakes are higher, and stellar performance is just what’s expected. It’s table stakes in the leadership game. You know it from your own experience, so keep it in mind when you’re dealing with your staff. Notice when they get it right. Thank them. Work side by side with them from time to time so they know you understand what they do and don’t feel you’re above doing it yourself. Your best leaders may not be the ones who spend the most time in the office. On the contrary, they’re likely the ones who regularly leave the office at a reasonable time and take their allotted vacation days. It’s often your more insecure leaders who are making a point to work crazy hours and never want to be out of the office for more than a day or two at a time. You know what results you’re looking for. Make sure you know who’s providing those results and acknowledge their contributions. It’s easy to let your best leaders run on auto-pilot. They know what they’re doing, they’re getting results, so you don’t want to get in the way. You have plenty to worry about coaching your less skilled leaders. They’re the ones on the edge of creating havoc among the staff. It’s true you need to focus on the leaders who need help, because they’re creating risk for your organization. But you also need to take time for the best leaders on your team. Scheduling weekly or biweekly one-on-one meetings with each member of your leadership staff will ensure the stellar performers aren’t cheated out of time with you. Your meetings with them will be different. They’ll be coming with solutions and ideas, in addition to areas where they need your help and support. They may have thoughts on how they can help you in your role—this is where succession planning starts. Don’t give in to the temptation to skip these meetings; they provide value to you and each member of your staff. To allow your best leaders to do their best work, you may have to help clear some obstacles out of their way. If your boss isn’t supportive, don’t pass that on to your staff. It’s up to you to manage up the line and prevent issues there from distracting your people. If other department heads are creating difficulties for your group, it’s your job to eliminate those problems. You can ask your leadership staff to deal with them, but if other department heads won’t deal with your people, you’ll have to step in. Involve your people as much as appropriate, but sometimes the conversation needs to be just you and your peer behind closed doors. The more information you can share with your staff, the better their decisions will be. Again, complaints about your boss or your peers aren’t productive and should be kept to yourself. But share anything else you can, about financials, company direction, competitive pressures, and more. You may get to feeling comfortable enough with your best leaders that you want to talk to them about their peers who aren’t doing as well as they are. This can work in very limited circumstances, where someone with good skills in an area can help somebody who’s weak in that area. But always limit yourself to that specific instance, and never discuss one leader’s overall performance with another. If you’re wondering if what you’re saying is appropriate, picture that other person sitting silently in the corner of the office. Would they feel uplifted by your conversation? If not, stop. For help with this and much more, contact the experts at The Taylor Reach Group, www.thetaylorreachgroup.com.